Why are Colorado’s Deer Populations Declining? According to Colorado Parks & Wildlife (CPW), the state’s current mule deer population of around 450,000 is about 25% below their objective. Populations have been declining over the last several decades due to human population growth resulting in habitat loss and vehicle collisions, as well as other factors like climate change, malnutrition, diseases like chronic wasting disease, and predation. A recent technical report from CPW examines the causes of deer mortality, specifically to help wildlife investigators determine the difference between predation and scavenging so that accurate causes of death can be determined and addressed. Since 2016 CPW has been studying whether predator control can help boost mule deer populations. You can read more about this strategy on CPW’s website. CPW has also recently released The Story of Colorado’s Mule Deer, a short publication for general readers that explores the history of mule deer in Colorado and some of the factors behind the recent population decline. Additional information can be found in Mule Deer in Northwest Colorado, a fact sheet from CPW summarizing their research in that part of the state. Colorado is not the only western state to experience declining mule deer populations. In 2004 CPW (then the Colorado Division of Wildlife) teamed with other western U.S. wildlife agencies to produce the North American Mule Deer Conservation Plan, which examines a variety of population decline factors including hunting, disease, and habitat loss. 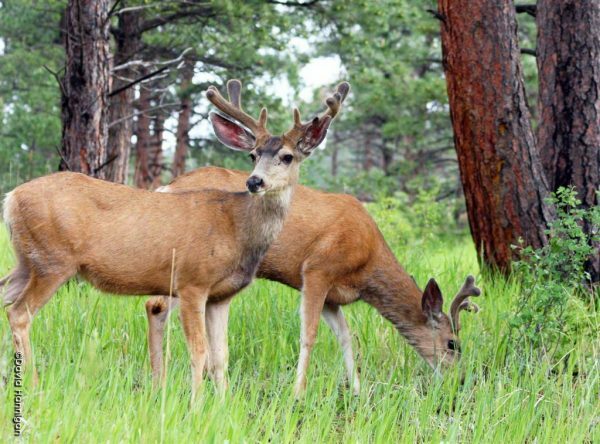 A few years prior, the Division of Wildlife also submitted a report to the Colorado legislature on declining mule deer populations. Our library collection includes numerous other resources on Colorado mule deer research; search our library’s online catalog for titles. Next CLIR: Digitizing Hidden Special Collections and Archives Grant Available. Are you kidding me? there are SO many deer around here – they are like RODENTS!